Gladstone, NJ – The National Para-Equestrian Championships featuring the USEF Para-Equestrian Dressage Paralympic Selection Trials continued Tuesday with riders performing their Individual Tests. 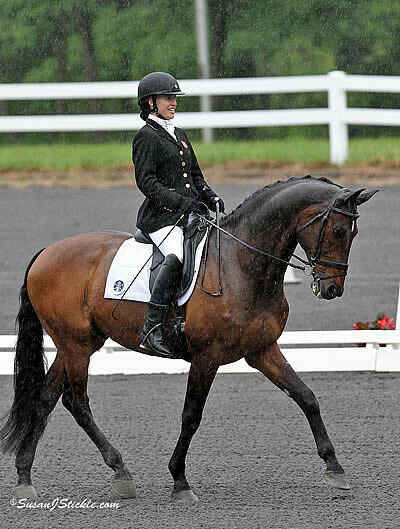 Riders braved the rain at the Pine Meadow location of the USET Foundation Headquarters to showcase their skills across five grades of competition. Following the second test of the National Championship and Selection Trial, Rebecca Hart and Lord Ludger lead Donna Ponessa and Western Rose by the slimmest of margins. Hart (Unionville, PA) is on a quest to claim her fifth National title and earn the opportunity to represent the U.S. at the Paralympic Games in London this summer. The 2008 Paralympic Games and 2010 Alltech FEI World Equestrian Games veteran earned the highest score of the day to win Tuesday’s Grade II Individual Test and lead the National Championship field. Hart rode Jessica Ransehousen’s veteran Holsteiner gelding to a score of 73.968% Tuesday on the strength of an accurate forward test. The 26-year-old is one of the most experienced para-equestrians athletes in the U.S. and understands the significance of this week’s competition. Hart is one of seven competitors that is riding two horses this week and feels that opportunity to ride multiple horses in competition is extremely beneficial. She rode Ransehousen’s Carlingford Taldi to fourth place in today’s Grade II Individual Test. Lying second in National Championship competition is Ponessa (New Windsor, NY) and Wesley Dunham’s Western Rose. The 9-year-old Oldenburg mare scored 72% to finish second in the Grade 1a Individual Test. Grade 1b rider, Jonathan Wentz (Richardson, TX) stands third in the National Championship with Kai Handt’s NTEC Richter Scale after scoring 72.899% in the Individual Test. He also stands fourth with Dr. Michele Miles’ Silvano. Ponessa won Tuesday’s Grade 1a Individual Test with Vinceremos Therapeutic Riding Center’s PG Ganda on a score of 73%. Wentz riding NTEC Richter Scale and Hart with Lord Ludger were the winners in Grades 1b and II respectively. Wendy Fryke (Parker, CO) rode her own and Michael Fryke’s Lateran to victory in Grade III competition on a score of 65.389%. For a second day, Mary Jordan (Wells, ME) was the winner of the Grade IV test with Deecie Denison’s Sebastian. Competition concludes Wednesday with riders performing their Freestyle Tests, which will count for the remaining 20% of the National Championship score. For results, photos and news, visit: http://usefnetwork.com/featured/2012USEFDressageFestivalofChampions/. Follow the U.S. Para-Equestrian Team at http://www.usefnetwork.com/featured/2012Para-Equestrian/.